August is Ripe for Roasted Peach Gazpacho | Good. Food. Stories. One day in elementary school, I ate a peach at lunch and it made my mouth itch a little. It was a strange sensation but I didn’t think much of it. But when I mentioned it absently to my mother—my mother who has a ton of food allergies—she … well, she kind of overreacted. And never bought peaches again. I ate peach jam and canned peaches and peach pie with no trouble, so I just assumed it was the fuzzy skin I was allergic too. And it wasn’t a huge deal. It’s not like I was allergic to anything else. Still, maybe partly because I knew I couldn’t eat them fresh, peach was always one of my favorite flavors: peach jolly ranchers and gummy candy as a kid, peach soda and sorbet in college. Picture pages flying off the calendar. It was now two years ago. I was living in Philadelphia and often went to farms in nearby New Jersey to pick apples, blueberries, and strawberries. One hot summer day, I went fruit picking with my sister and her girlfriend and we stopped at a peach orchard. The smell of warm peaches hung heavy in the air and flies buzzed at ripe peaches split open on the ground, stewing in the summer sun. It was one of the most amazing things I’ve ever smelled and I thought, It’s been so long since I’ve eaten a peach … maybe I’ll just try one bite. So I did, telling my sister that if I died she should tell my mother I was sorry for not listening to her! Spoiler alert: I am not allergic to peaches, y’all. I don’t know what was up with my mouth that day in elementary school, but as I bit into a sun-warmed peach picked straight from the tree, that tangy sweetness exploding on my tongue, I laughed at myself for how many years I’d let go by without trying one again. I ate the whole peach, then another, then picked so many I had to make jam and pies to give away in order to use them up before they went bad. It was so worth it, though, because they are now the fruit whose season I most look forward to. Gazpacho is also something I look forward to all year, and when it gets hot enough that I can’t stand eating anything even lukewarm, gazpacho is my savior. Bright and tart, complex and fresh, it holds the possibility for a million variations, each one better than the last. 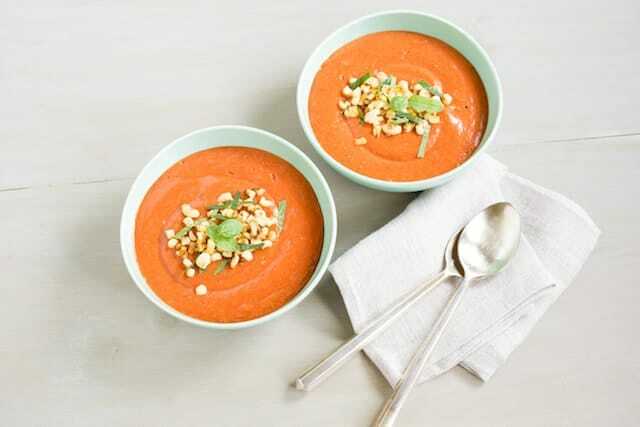 I love a classic gazpacho with tomato, cucumber, peppers, and onions; I love a white gazpacho with roasted cauliflower, cucumber, and almonds. Really, I love them all. But pride of place in my repertoire goes to the humble combination of two fruits that, when ripe and in season, are everything: peaches and tomatoes. Since gazpacho is chilled, I love the sweetness that peaches bring to this soup, the cool temperature taking the edge off their syrupy taste. Ripe tomatoes are dusty and robust, balancing the peaches with their own kind of earthy freshness. And rounding the whole thing out is garlic, one of my favorite pairings with peaches, and a little bit of cinnamon. It’s so incredibly simple, but makes for a unique twist on a classic soup for summer. It’s super on its own, but if I’m feeling fancy (or serving this soup rather than eating it all myself in my pajamas), I like to top bowls of this gazpacho with some charred corn, toasted pine nuts, and a little bit of fresh mint and basil. The big question here is whether you like your gazpacho raw or cooked. This one can go either way. When your peaches and tomatoes are so ripe and succulent they’re practically oozing, throw all the ingredients in the below recipe directly in the blender raw, and you’ll have a light gazpacho that’s almost reminiscent of a smoothie. Produce not quite ripe, or want a bit more depth of flavor? Cut them into wedges and roast as directed for a fuller, heartier gazpacho. The silky texture that roasting the peaches lends is my favorite thing about this method. Or, if you want the best of both worlds, go half cooked and half raw. 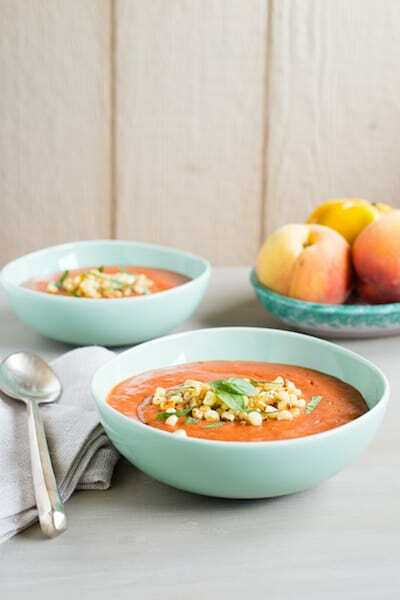 No matter what, the balance of the peaches’ sweetness, the tomatoes’ earthiness, and the garlic’s tang will make for a gazpacho you can eat for breakfast, lunch, or dinner—believe me, I’ve eaten it for all of them. Preheat the oven to 400 degrees and line a rimmed baking sheet with parchment paper or a silicone liner (the sugar in the peaches tends to caramelize and stick if you use foil). Toss the tomatoes, peaches, and garlic with the oil, thyme, cinnamon, and cayenne in a large bowl. Spread the seasoned fruit evenly across the prepared baking sheet and sprinkle with salt. Roast for 20-30 minutes, or until peaches give at the touch of a finger, but aren’t mushy. Tip: press your garlic cloves into the seedy centers of a few tomato wedges to keep them from burning or drying out. Transfer everything on the baking sheet, including any juices that oozed out, to a blender. Blend on medium-high speed until pureed, adding more cinnamon and salt, if desired. (Be careful not to add too much salt, though, because chilling the soup will change its taste. You’ll want to re-taste after it’s chilled. Chill completely–at least 2-3 hours. Prepare your toppings just before serving. If you don’t have a grill to char your corn, preheat a cast iron pan over medium high heat. Either cook the corn whole for a few minutes on each side–just enough to get the charred flavor–then slice the kernels off the cob, or slice the kernels off and cook briefly in the pan if the entire cob doesn’t fit.